Every dSLR user must know how to deal with dust. Even weatherized cameras are vulnerable to this problem. Unless you’re working in a NASA clean room, you allow dust to enter your camera every time you change lenses. Dust that shows up in your photos should be obvious: big, fuzzy, dark spots. You won’t see much by looking into the camera when you change lenses unless you have a loupe, a special type of magnifying glass. If you’re in doubt, photograph a clear blue sky and check for spots in the photo. Address the problem — don’t ignore it. Over time, dust bunnies will start showing up in your photos. Self-cleaning (sensor shaking) is your first line of defense against dust. The camera shakes the dust off the sensor to try to clean it. You don’t have to open the camera, blow anything in, or swab anything out. In that respect, it’s relatively foolproof. It might say that cleaning is in progress. Most manuals suggest that you place the camera on a flat surface, bottom down. Many cameras have a self-cleaning mode. Some use self-cleaning with manual blowing. After you make the menu choice, the sensor shakes and then the mirror locks up so that you can blow out dust. Some cameras can be set to perform the sensor shake every time you turn the camera on or off, or perform it on demand. You may be able to turn off cleaning entirely. This will save your battery and speed start-up and shutdown times. Camera manufacturers recommend locking the mirror for manual cleaning with fresh batteries. If you have an AC power adapter, you can use it. Go to your camera’s sensor cleaning menu. Turn on the manual cleaning mode. It may have any name: Mirror Lock Up, Mirror Up, or Self Cleaning. Don’t choose self-clean. You want the mirror raised and out of the way, but you’re going to do the blowing yourself. The camera may shake the sensor during this step to throw off dust, and that’s fine. Take off the lens or remove the body cap and make sure the mirror is raised. If the mirror is still down, replace the lens or cap and turn the camera off. Return to Step 2 and start over. If you can’t get the mirror to raise, and you know you’re using the right menu, you may need to contact a service center. Move the camera so that the opening faces or is tilted downward. This makes it easier for the dust to fall out of the camera when you blow it. Take a blower and squeeze-blow air into the sensor cavity three or four times. Don’t push the tip of the blower into the open cavity. It isn’t a vacuum cleaner. You get plenty of air movement by hovering the tip even with the lens mount or just outside the camera. Don’t use a canned-air spray blower. Don’t use a blower brush, either. Use a blower that you squeeze with your hand. Don’t dally. The more you have the camera open, the more dust can get back in. Put down the blower and put the camera back together. Turn on and check the camera to make sure it’s working. Take a few test shots. Stop down to a small aperture and take a photo of the sky or your ceiling, to see whether it shows any dust spots. 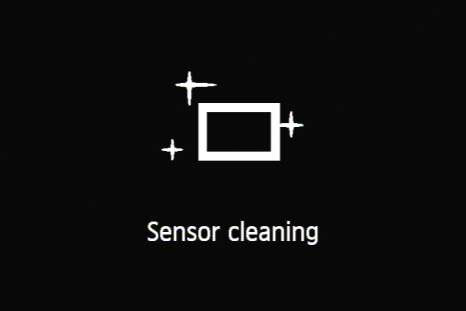 If it does, you can try cleaning the sensor yourself or send in the camera for maintenance. Dust can be so infuriating that people are often tempted to resort to extraordinary measures to clean their cameras. The most extreme solution is to manually swab or brush the image sensor yourself. With the right equipment and a steady hand, it’s not impossible. Most camera manufacturers don’t recommend you clean your camera lens via brushing it yourself. They suggest sending the camera to an authorized service center to be cleaned. If you insist on cleaning the sensor yourself, look in your manual for the proper procedures, if possible. Don’t open your camera and touch anything inside it unless you’re sure of yourself and willing to take the risk. Look in your camera’s manual for websites or phone numbers you can visit or call to find the nearest service center. Have your dSLR cleaned by someone trained and practiced in it. It’s not the end of the world to pay for a bit of routine maintenance. Make sure to get it done before important trips, holidays, occasions, or other events where you’ll be taking a lot of photos. That way you’ll feel like it was worth it.